ROLLESTON. It will be interesting to thousands who may not have heard of it, for here came a child who was to grow up to delight the hearts of a whole generation with her pictures of children. 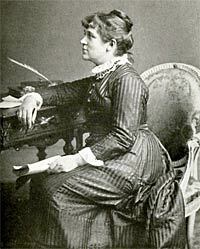 She was Kate Greenaway. It was in this village that she spent a happy childhood and found an ideal background to her growing mind—country children, orchards aglow with blossom, the sights and sounds of the seasons. Here she drank in the spirit of Nature and grew up with her mind full of poetry and music and beauty. She studied children wherever she found them, and was able to exhibit her first pictures of them when she was only 22. She imagined an idealised childhood and dressed it in the costumes of her own devising, now familiar to us all. Who does not know her incomparable gowns and the poke bonnets of her little girls? She never grew stale, never overtaxed her skill or allowed her inspiration to grow dim. She illustrated poems and books and Christmas cards, and her pictures have gone all over the world, so that when she died at Hampstead, early in her fifties, her work was almost as well known in Germany and France as in England. She was brought here, as young as the youngest child in her pictures, to stay with her great-aunt Mrs Wise; but it was in a little red brick house where the road sets off to Fiskerton that she spent many of her happiest days with her aunt's old servant, Mary Chappell, and her husband Thomas, whom Kate loved to paint in his smock and tall hat. It was to this cottage-farm that she came for holidays long after she went to live in London, for Kate Greenaway never forgot this village in the green meadows where the River Greet turns the old mill-wheel on its way to the Trent. Beyond the Chappell's house is the farm where lived Mrs Neale, with whom Kate and Mrs Chappell used to go to Newark market. The child loved every minute of the time, going round with the butter and wondering why people bought groceries when they could afford peppermints. Still farther along, where two oaks make an arch over the road, we catch a glimpse of the Odd House, a farm with a background of woods. It was the home of Kate's Aunt Aldridge, who would sometimes take her to market in a high dog-cart, giving her dinner with the farmers and their wives at one of the inns. By the smithy is the base of an old cross, and not far away is part of another in a field where remains of fishponds and a moat mark the site of the old manor house pulled down over a century ago. 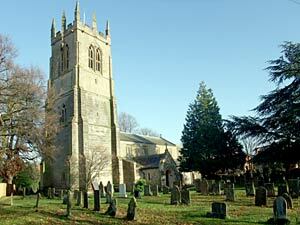 It was the home of the Nevilles, who were lords of Rolleston from the 13th century till the time of Elizabeth. Two stones carved with their arms carry the hinges of the door of one of the barns. The church has something of Saxon England. There is early herringbone masonry in its walls, and fragments of Saxon crosses came to light in 1895. Three blocks carved with knotwork are believed to be parts of a shaft, and a smaller fragment built into the wall is remarkable for having the name of the maker of the cross in neatly cut Saxon capitals, and small letters which mean, Radulf made me. The outer walls of the splendid tower have been faced with new stone, but the original work of the Normans is seen in its lower walling inside; the rest of the tower is 15th century. The Norman south doorway has been rebuilt stone by stone; on it is what may be a consecration cross, and a stone with remains of a sundial which may be Saxon. In a niche in an aisle is the fluted bowl of a Norman shaft piscina. The chancel arch and the nave arcades with clustered pillars are 13th century. Among the medieval windows is an unusual one like a quatrefoil in each aisle, about 600 years old. There are two medieval coffin lids, and fragments of others are in a wall. The tiny font is 17th century, the chancel screen has a 15th century base and a new top, and the tower screen is the good work of a local craftsman of our day. A rare treasure is a portion of the original paper register which was continued after the day of parchment registers had come. It has nearly 40 leaves stitched together, covering the years 1584 to 1615, and is full of quaint notes made by Robert Leband, a vicar who was drowned by falling from a bridge. His notes tell of current events, local gossip, the weather, the price of corn, and odd things about his flock. He had a good habit of sometimes putting unfavourable comments in Latin. We read that Joane Peele was "so singular a housewife as Rolston could not match." The good vicar must have known less noble types, for we read again that we must not trust a woman, even when she is dead. A memorial of 1706 is to John Twentiman, a vicar who made interesting entries in the registers in beautiful handwriting. RUDDINGTON. Its three thousand people make it one of the biggest villages in Notts, busy for the most part with hosiery and lace. For half a century it has had a fine big church in place of a medieval one which had seen much change. Imposing outside with battlements, roofs of green tiles, and a spire crowning a tower in which much of the older one survives, it is dignified inside, with a finely timbered roof looking down on the lofty nave arcades. There is rich carving of wood in the modern chancel screen, and of stone in the pinnacled sedilia. With the stained glass filling many of the windows are the Twelve Apostles in the south aisle. The face of the Good Samaritan in one window is that of a village doctor who died at the end of last century. Between the village and Edwalton is a deserted graveyard with a few headstones, reminding us of the lost village of Flawforth which was once important enough for its church to be the mother church of both Ruddington and Edwalton. 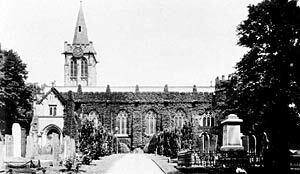 When the church fell into disuse its windows were used in the rebuilding of Ruddington chapel, and when it was finally pulled down in 1773 much of the material was used in making Ruddington's churchyard wall. Flawforth will not soon be forgotten, for three wonderful alabaster figures once in its church are preserved at Nottingham Castle.